Buddy Catlett is a snapshot of everything that's right and wrong with jazz today. A player with legends for more than fifty yearsand supposedly Count Basie's favorite bassisthe's currently gigging as a sideman in a Seattle club on Thursday nights. Such unpretentiousness and enduring passion for the craft is what makes so many longtime players so admirable. So why aren't there enough admirers to pack the house on weekends? 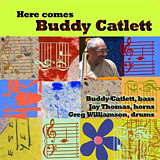 Part of the answer lies in his 2004 trio album Here Comes Buddy Catlett, a fine collection of traditional classics featuring Greg Williamson on drums and Jay Thomas on saxophones and horns. It's tough getting listeners who are accustomed to the funk of Marcus Miller, the evolving modernism of Dave Holland, and even the moodiness of Charles Mingus to put this kind of tradition at the forefront of their consciousness. Still, this is the kind of music that can and ought to appease caffeine fiends at cafes on Sundays instead of Romantic Sax For A Rainy Morning or whatever market-driven title is getting background air these days. Maybe if Catlett took a page from musical soulmate Ray Brown and called this Swingers For Starbucks, it'd catch on. Deeper thinkers should go straight to the thirteen-minute "Blue Monk/Mysterioso/Round Midnight" and hear Catlett stretch out twice in his tastefully restrained way. He plays unaccompanied during the second solo, delivering a clinic in sparse lyrical phrasingand here's where listeners will find out if they can relate. Some won't; there are players young and old with more flair and complexity, and the only cutting-edge element is 21st century sound quality brought to some Count Basie-era thinking. The appreciative will find him swinging with effortless smoothness on "Without A Song," bowing wistfully on "Night Mist Blues," and dominating "Blues For Buddy" withnaturallya bouncing step through a relatively simple progression supplied by his bandmates. Thomas, who's appeared on more than fifty albums during a nearly forty-year career, anchors much of this disc with lush chorus lines and instrumental versatility. His flugelhorn seduces like a decaf latte on "Here's That Rainy Day," captures the spirit of greats like Freddie Hubbard on trumpet during "Blackbird," and he and Williamson share the most lively interaction on the playful Latin of "On The Brink." Williamson is generally crisp, light and precise, a point guard making teammates better without dominating the stats himself. Here Comes Buddy Cutlett will satisfy those familiar with his style of playing who have the patience to appreciate it. Such listeners may or may not exist in droves anymore, but it's not like he's slipped into obliviona tribute to him was the closing act at Seattle's Earshot Jazz Festival this past fall. Maybe a few of those with coffee cups who happened to be in listening range got enough of a caffeine jolt to snap out of background music mode and ask what this long-timer is all about. Track Listing: Night Mist Blues; Here's That Rainy Day; On The Brink; Darn That Dream; Blackbird; Is It True (About Dixie? ); Blues For Buddy; Long Tall Dexter; Blue Monk/Mysterioso/Round Midnight; Without A Song; Yesterdays. Personnel: Buddy Catlett, bass; Jay Thomas, saxophones, trumpet, flugelhorn; Greg Williamson, drums.